Art Review: Art Resource Association Members Show, and paintings by Georgina Forbes. T.W. Wood Gallery, Montpelier. Through December 20. The T.W. Wood Gallery in Montpelier runs two simultaneous exhibitions each month; the current pair is particularly strong. A solo exhibition by painter Georgina Forbes fills the Wood’s South Gallery, while the Art Resource Association’s annual show occupies the spacious Main Gallery area. The ARA’s website explains that the central Vermont organization has been “dedicated to supporting artistic excellence and expression and enhancing public understanding of the visual arts since 1975.” The 2007 members’ show confirms the group is living up to its mission. Thirty-five of the association’s 100 members contributed 90 works to this energetic, well-curated exhibit. Deborah Hillman’s small diptych, “Terrain,” draws attention to a wide variety of textures by downplaying color. Her tandem canvasses are like satellite images of a pale blue and white glacier, with flowing lavender lines etched in the ice. Hillman scraped the lines into thick layers of oil paint to reveal pale lilac passages beneath. Another nonobjective abstraction, “Veil,” employs similar sinewy lines. Its vertically oriented channels were cut into fields of sky blue, gray and alizarin crimson. Hillman handles paint with varied applications, from palette-knife work to scumbling and scraping. The large acrylic painting, “Boxed,” by Gladys Agell, is a blend of abstraction and expressive realism. 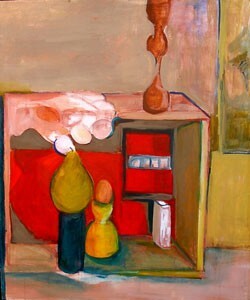 A loosely painted pear on a pedestal, an egg in a cup and other, less discernible objects are situated in an open box interior; the backdrop is draped in bright red. The latter color is actually part of a subtle, sophisticated harmony of Sienna, blue-green and tinted whites. The off-center composition is interesting, too, with angular shapes contrasting with Agell’s rounded still-life elements. “Remembrance,” by Barbara Scotch, is a roughly 40-inch-tall copper sculpture. Her materials probably came from the plumbing section of a hardware store rather than an art supplier. Scotch fashioned an open book from smooth, rectangular copper plates, and set it on a scaffold-like stand by joining several small-caliber, bright copper pipes. The book has no text, but etched on its facing pages is a roadway, flanked by trees, that recedes into the gleaming picture plane with one-point perspective. “Peace” is the title of Wilma Lovely’s mixed-media assemblage on a wall-mounted slate tablet. It’s one of just a few pieces in the show that refer to the holidays, however obliquely. An ornate dove, fashioned from long, thin beads and milk-glass shards, flies majestically across a checkerboard pattern of alternating blue glass mosaic tiles and dark red squares. Lovely, an 84-year-old self-taught artist from Calais, encrusted her work with gold and silver costume jewelry, beads, baubles and faux precious gems. “Peace” is an exquisite, richly decorated piece of folk art. The Forbes show in the South Gallery is entitled “Essential Elements.” The artist’s exhibition of 17 abstract landscapes is a brilliant display of stain painting. Layer on layer of thin, yet very rich, hues generate complex chromatic harmonies as they seep into Forbes’ canvasses. Some are 4 feet square in scale. “Spring” captures a valley vista as majestic as one in an Albert Bierstadt Hudson River School painting, but Forbes paints with splashes rather than traditional techniques. The sky here is a glorious blue, pregnant with vaporous gray and white clouds. Nascent foliage is indicated along the edges of the panorama with spatters, runs and patches of crimson, yellow-green and deep bluish-purple. “Flow, Fall, Fly” describes an ethereal waterfall, set in a broad gorge of orange, vermilion and blue. Effervescent white mist rises over the scene, wafting into another dramatic Forbes heaven of realistic hues. Her naturalistic skies stand in marked contrast to the flamboyant, inventive hills and foliage. The present shows round out the 111-year-old T.W. Wood Gallery’s 2007 season. More such noteworthy exhibitions are no doubt in the works for the new year.